The readings in this week try to investigate the definition of digital visualization in several perspectives. For humanists, any form of data, which might be resulted from the acts of interpretation between the readers and images, have specific meanings. For different groups, different audience, digital visualization serves as different roles and contains different meanings. Defining as artifacts, texts, processsable information as well as evidence, digital visualization provides a opportunity for humanists to bring sophisticated methods in close reading of text and artifacts into service for the new species of text and artifacts. ( Owens,84) Owen’s article actually give me some inspiration such as how humanists deal with the relation between the data and images. This topic have some relations with the study I am interested in. 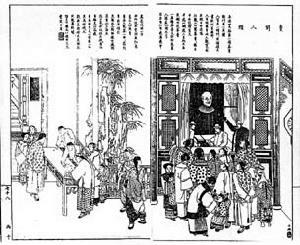 The imagines I posted below named Dianshizhai pictorial, which were given as a gift to the citizens. The pictures on Dianshizhao pictorial alongside with little pomes always talks about the news and issues happened at that time. And recently, lots of scholars are studying this special pictorial. Not only interested in the content of the pictorial, but also the author，the lower middle class’s attitudes towards the society at that specific time. Meanwhile, Martyn’s article concerns more about the development of digital visualization as a scholarly activity. He uses the London Charter as a case to illustrate that what kind of standard and methods should be proper for scholarly activity for digital visualization. (Martyn) As a scholarly methodology, digital visualization still lack of precise and rigorous standards. Reading those articles give me some hints about how to present the information effective and efficient. Which way is considered to be the best way to convey the information? The development of infovis actually has more relevant to scientific technology or humanity development? What is the difference between information design and information visualization. The former deal with the data that already has a clear structure, the later discover the structure of a data set. (Lev Manovich). And what kind of visualization is more convenient to the public? Finally, Manovich also mentions the relationship between visualization and humanity. Known from the sciences, humanity more focus on one issue rather than the general laws, which means that displaying the actual visual media are more helpful for people to understand a single artifacts. However, will the media visualization, which contains the original media artifacts, show too many information in front of audiences and finally vague the theme of artifacts? Whether media visualization is more efficient or less? That may need to be considered. Hello, I am Yuanyuan. I am also a student in MA of American Studies for International Students program. I study the history of architecture and the relationship between environment and human . And I am also interested in the race, gender the culture studies!